Submissions for this issue are closed. Below our brief to the contributors of issue 00! We’ve been sharing inspiring stories, and (photo)essay’s online for quite a while now, but we are going to take it a step further. In addition to the website, we will be making a printed magazine. We love magazines for many reasons. We think it offers a truly unique experience to the reader. The feel and smell of the paper as you leaf through the pages, the presence of a beautiful piece of literary art on your coffee table or on your bookshelves. Besides, isn’t it nice to be away from your screen every now and again! The content consists of carefully curated stories, that are categorized in a premeditated order and they can’t change after it has been printed. One way of categorizing is by means of a theme. Our magazine is no exception. Below we will introduce the theme of our first printed magazine and we hope it inspires you as much as it does us, especially because we want to make this magazine together with you. So if – after reading – you believe that you have a story to share or have an idea for a story, please reach out to us, so we can cooperate on this next step. Ever since we started the Let’s Explore platform, we’ve been discovering and rediscovering ourselves. We kept exploring where and how we, as a platform, position ourselves; where do we as storytellers fit in; and how we would like our contributors and collaborators to fit in. In short: where do we belong. 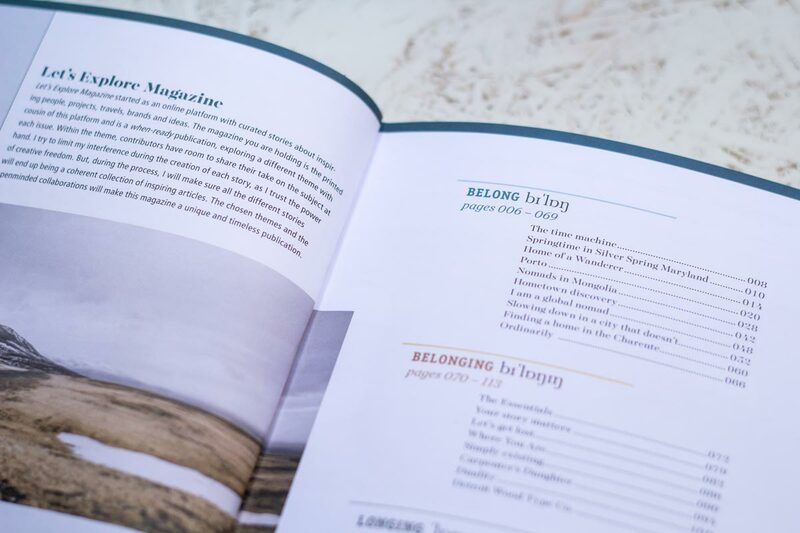 So far, this journey has been incredibly inspiring and because of that, we decided that the theme of our first printed magazine should be belonging. We are not looking for answers, but we’re aiming for an exploration of what belonging can mean. Like we said, we want to make this magazine together with you and we are extremely curious about how you would explore this theme. Because of the fact that belonging can be interpreted in a lot of ways, we’re dividing it into three sub theme’s: be|long|ing (belong, belonging and longing). The first part explores places that have a meaning for the storyteller. This can be any place you have strong feelings about; a room, a town, even an entire country or a community you’re part of. How does that place relate to the theme of belonging for you. What is it that makes you belong, or not belong, to that place. The second part explores objects that define a person or place. Think of anything that you hold dear. A token, an heirloom, a collection, travel/photography/writing essentials, contents of your notebook/sketchbook/(travel)journal/bag/photo album. The last part explores a desire of the storyteller. This transcends the first two sub themes. You can long for places and objects. You can feel nostalgic about people and places. But you can also think about an anticipation of something that is going to happen, like going on a trip or buying a house and making it into a home. So where do we go from here? We’ll be taking submissions from now on. We’ll start designing as soon as stories come in. Making it a dynamic process, in which we work closely with the authors and photographers, to make sure the story is told in the best possible way. So if you feel inspired by the theme, please submit your story, or pitch a new story by sending us a summary with a max. of 400 words and 5 images (optional) at submit@letsexploremagazine.com. Also, include your idea about which sub theme would be best suitable for your story and why. We’re looking forward to hearing from you and to start working together with you on this new adventure.